Small but powerful driver for quickly enable PCI USB 2.0 Adapter such as Adaptec AUA-4000 USB2Connect Adapter, Orange Micro Inc. OrangeUSB 2.0 Hi-Speed PCI Board, etc. USB 2.0 Mass Storage Enabler is a class enabler. In other words it will enable any PCI USB Adapter regardless of PCI adapter manufacturer and model. Fully compatible with Norton Ghost and PowerQuest Drive Image under MS-DOS and Windows 9x DOS. 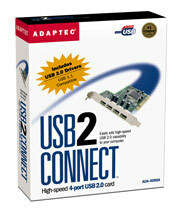 Supports any USB 2.0 and USB 1.1 PCI adapter. Cooperates with USB BIOS. Do not disturb functionality of USB devices (such as USB keyboard and mouse) configured by BIOS. Relocates parts of enabler code to upper memory automatically. Support backup and restore to/from NTFS partitions under Ghost 8.x. Simply start driver from the command line or from autoexec.bat without parameters. The only restriction is that driver should be started after any memory manager such as HIMEM.SYS and EMM386.EXE. Support of USB Device normally requires a whole stack of drivers. Usually you need at least a PCI enabler (unless your PCI USB controller is configured by computer BIOS), and functional driver (such as Cypress Semiconductor Corporation DUSE). USBMASS provides both: a PCI Enabler and build-in functional drivers for USB Disk and USB CD-ROM. Generally speaking as long as your USB devices are limited to USB disk and/or USB CD-ROM, you do not need any of third party USB driver - USBMASS will do the job. In difference with any other USB software (such as Cypress Semiconductor Corporation DUSE 4.x), USBMASS by default do not change configuration of USB 2.0 or USB 1.1 PCI adapter assigned by BIOS and therefore do not disturb work of any device supported by BIOS.